Richardson & Wrench Alexandria|Waterloo are proud supporters of the Starlight Childrens Foundation Australia, an affiliation which is now over 7 years strong. Starlight programs are integral to the total care of seriously ill children and young people. While health professionals focus on treating the illness, Starlight is there to focus on the child - lifting their spirits, giving them an opportunity to laugh and play, building resilience and improving their wellbeing. 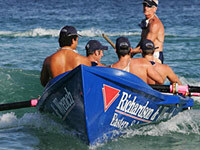 Richardson & Wrench Alexandria|Waterloo are proud sponsors of the Bondi Surf Bathers Life Saving Club and have been supporters for many years. The Bondi Surf Bathers’ Life Saving Club (Bondi Surf Club) is officially recognised as the oldest surf lifesaving club in the world. It is an Australian icon and holds an indelible position in Australian history. The Bondi Surf Bathers’ Life Saving Club was established on the 21st February 1907 at the Royal Hotel Bondi Beach by a group of like-minded bathers. The club was responsible for introducing surf lifesaving to Australia and pioneered the famous surf reel and is responsable for saving many lives every summer in Bondi.